We have been in business since 1989, and proud to have 5 DJ shows available. Our DJ's include:Dave & Natalie Knutson owners, Evan Baumler, Mark Benda,and Tanner Baumler . We have a total of 90,000 songs in DJ, Video, and Karaoke, with a wide variety of music ranging from oldies, country, rock, big band,swing and top 40. We are a legal DJ purchasing our music from RPM record company and Promo records. Also, we are fully insured. Our shows consist of 4000 watts to be as quite or as loud as you like. Our lighting is all new with LED panels, roto pods, effect lighting and moving heads. New to our business is up lighting and pinspots, that are completely wireless. These are used for decorating your reception center. Up lighting changes the color of a room, with splashes of radiant beams up against the walls. 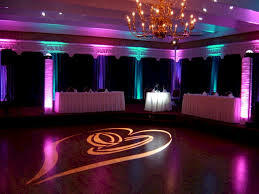 So we can match your wedding colors and change the atmosphere of the room. The pinspots luminate important areas, like the cake table, head table or serving table. Also, we have projectors and screens available to show your slide show during the reception. If you would like us to make the video for you, we can do that as well! Please call us for your wedding, anniversary, birthday party, prom, school events or parades to get a price quote for DJing and for our new up lighting and pinspots. Copyright © 2011 - Thoroughbred DJ & Karaoke. All Rights Reserved.